John H. Durham, United States Attorney for the District of Connecticut, Brian C. Turner, Special Agent in Charge of the New Haven Division of the Federal Bureau of Investigation, and Kristina O’Connell, Special Agent in Charge of the Internal Revenue Service – Criminal Investigation in New England, today announced that a federal grand jury in New Haven has returned a nine-count indictment charging three Michigan residents with conspiracy and fraud charges stemming from an alleged scheme to qualify prospective and current federal inmates who do not require substance abuse treatment for admission into a Federal Bureau of Prisons program that, if completed successfully, will result in a shortened prison term. Charged in the indictment, which was returned on January 15, 2019, are TONY TUAN PHAM, also known as “Anh Nguyen,” 49, of Grand Rapids, Michigan; SAMUEL COPENHAVER, 47, of Grand Rapids, Michigan, and CONSTANCE MOERLAND, 33, of Hudsonville, Michigan. The three defendants were arrested on January 23. According to the indictment, the Residential Drug Abuse Program (“RDAP”) is a 500-hour substance abuse treatment program that is administered by the Federal Bureau of Prisons (“BOP”). In order to gain admission to the RDAP, a federal inmate must meet certain criteria, including having a diagnosable and verifiable drug or alcohol abuse disorder. By successfully completing the RDAP, an inmate can qualify for up to 12 months in early release from custody. The indictment alleges that Pham, Copenhaver and Moerland were managing partners of Michigan-based RDAP Law Consultants, LLC. 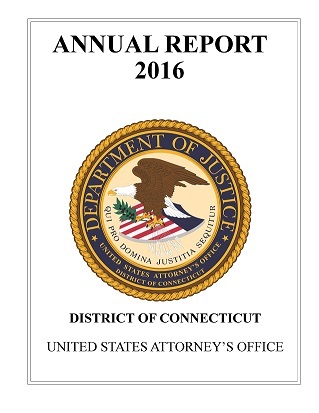 The defendants solicited prospective and current federal inmates, including individuals in Connecticut, through telephone calls and emails with offers of assistance in applying to, and qualifying for, the RDAP. For a fee, the defendants coached and advised prospective and current inmates on how to gain admission to the RDAP by lying to the BOP about the existence, duration and extent of a qualifying substance abuse disorder. The indictment charges Pham, Copenhaver and Moerland with one count of conspiracy, an offense that carries a maximum term of imprisonment of five years. The indictment also charges Pham and Copenhaver with multiple counts of wire fraud, and offense that carries a maximum term of imprisonment of 20 years on each count. This investigation is being conducted by the Federal Bureau of Investigation and Internal Revenue Service – Criminal Investigation Division. The case is being prosecuted by Trial Attorney Avi Perry of the Department of Justice’s Fraud Section, who has been designated as a Special Assistant U.S. Attorney for this matter. The prosecution in the District of Connecticut was facilitated by significant assistance from Assistant U.S. Attorney Meredith George Thomas of the U.S. Attorney’s Office for the Southern District of West Virginia. U.S. Attorney Durham thanked the U.S. Attorney’s Office for the Western District of Michigan for its assistance in this matter.